Tobias played a T-ball game today. 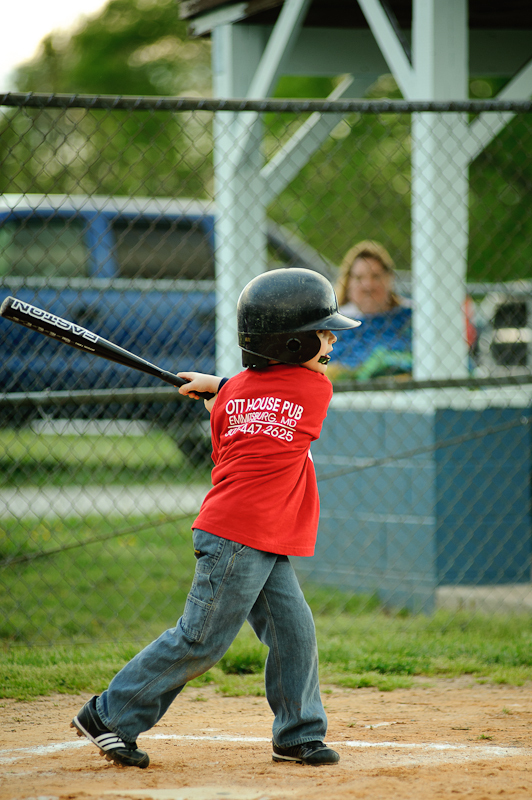 It is called T-ball, but they get a chance to hit live pitches before placing the ball on the T. The top picture is Tobias following through after a miss. I chose it because it shows off the team's sponsor. I'm a good spokesperson, so if anyone out there wants to sponsor me... wait, I'm kidding! Sorta. In any event, the Ott House is a little pub/restaurant on the square in town. Even if you don't live around here there is a reasonable chance some of your local firefighters visited there. The National Fire Academy is located in town, and I see hordes of Academy students walking there in the evenings after classes. 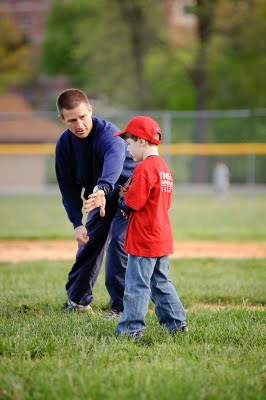 Here is a shot of Tobias getting coached between innings. He did pretty well tonight. He had fun, hit a couple times without the Tee, made a couple plays in the field, threw a bunch of dirt in his hair, mudded up a pair of pants, and ran all the bases. That is a pretty good box-score.